The surprise and delight of a child meeting an animal at a farmed animal sanctuary reveals the evolutionary bond of kinship between humans and other animals through the lens of these innocent, but not childish, encounters. 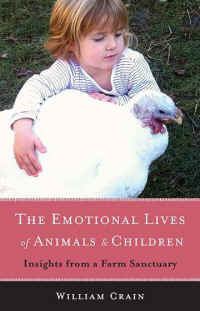 That children are enchanted by a chicken, a turkey or a pig at a sanctuary, and the reciprocity that springs between them, shows that our interspecies connections go far beyond just keeping a “pet.” This prospect is explored, with significant implications, by William Crain in his new book The Emotional Lives of Animals and Children: Insights from a Farm Sanctuary. Bill describes his and Ellen’s evolution, through their busy professional lives, toward a growing concern for animals. A bear hunt proposed by New Jersey wildlife agencies drew Bill into taking a public stand against the hunt. A configuration of personal feelings and local situations threatening a parcel of woods and the lives of animals, and an epiphany Bill had one bleak autumn day amid trees and birds, led to the founding of Safe Haven Farm Sanctuary. Bill explains that the decision to start a sanctuary for farmed animals included his desire to help and learn about the animals and to see if his observations and discoveries regarding them could shed light on human behavior, especially that of children, with a particular focus on the bond between children and (other) animals. The child who cares about animals, he writes, “grows up in a society of adults who are largely indifferent” to animals and may even mistreat them purposely for pleasure, as exemplified by the canned bird hunts that are sponsored by a hunt club situated right next to Safe Haven Farm Sanctuary, where several terrified ducks and partridges have sought and found refuge. A key question posed by The Emotional Lives of Animals and Children is: what happens between childhood and adulthood that causes most children to outgrow their primal delight in and empathy with animals and become detached, callous and indifferent toward them? Is it hormonal changes? Social conditioning? Crain offers a variety of speculations, but the answer remains a mystery, and with it the wonder of what to do about humanity’s detachment from and denigration of animals in a world run by the very adults who must have cared about animals when they were young, but lost the connection growing up. With the onset of adolescence, a child’s feeling for animals gives way to preoccupations with peers, boyfriends, girlfriends and the like. It is tempting to focus on the dissociation of Western societies from Nature and animals – the effects of television, video games, less time spent outdoors and so on, yet earlier times and other societies don’t necessarily provide an antidote. Belief in human superiority is not limited to Judeo-Christianity or the Renaissance view of Man as the Measure of All Things, and while other times and places may have included animals more intimately than ours in the form of totems, spirits and physical presences, this did not necessarily foster compassionate treatment of animals as a social norm. Indeed, one of the worst fates for animals historically has been to be deemed “sacred,” and not all childhood behavior toward animals is benign. Crain discusses the English Romantic poet William Wordsworth’s tracing of his loss of childhood entrancement with Nature, but Wordsworth himself doesn’t know why the glory faded with age; he can only evoke the loss and shore up the ruins. An argument between Wordsworth and Samuel Taylor Coleridge centered on Wordsworth’s initial belief that living in Nature inspires positive emotions and values in people, whereas Coleridge argued that only people who are predisposed to be “taught” and moved by Nature are susceptible to her beauty and “teachings.” Wordsworth’s own chronicles of English rural life in his poetry depict poverty, squalor, despair and meanness along with some passionate examples of human devotion and stoic suffering. It is notable that while Wordsworth was intoxicated by Nature as a child, animals figure very little in his poetry. Flowers, rocks, trees and waterfalls affected him powerfully, but his poetry doesn’t bolster the view that a love of Nature invariably involves caring about animals in a personal and morally active way. Having run a sanctuary for chickens, turkeys, ducks, guinea fowl and a peacock for 30 years, I regard farmed animal sanctuaries as vitally important for the animals, the caregivers and the public, who otherwise have little or no way of meeting and learning about chickens, turkeys, cows, pigs, goats and other animals deemed “agricultural.” There are few or no ways outside a sanctuary for mainstream people to experience farmed animals in a context of human love, care and respect for them as opposed to, say, a petting zoo, where a whole other atmosphere prevails. Where else are people going to see farmed animals being happy? Between the food store and the animal farm, a false and demeaning rhetoric of agribusiness and advertising intervenes, and it is almost exclusively through sanctuaries such as Safe Haven that visitors and readers of a book like The Emotional Lives of Animals and Children have a chance to perceive farmed animals appreciatively. At the same time, a farmed animal sanctuary is an artificial environment whose refugees have come from more or less traumatic backgrounds and who, unlike their counterparts in Nature, are not busy raising families and engaging in the daily activities that occupy and energize animals in the natural world, which for them is not the “wild,” but their home. I don’t know how much we can ultimately learn about human nature or how to repair the broken bonds between adult humans and other animals from a farmed animal sanctuary, but it is possible we can learn and do a lot, especially with the many Internet sites and Facebook pages for sanctuaries that are now available and the videos being made of rescued farmed animals (Bill Crain has created some lovely ones), even if we can’t physically visit sanctuary locations. Tragically for animals and most people, a shadow – an iron curtain – falls between the child and the adult who share the same body and presumably the same psyche, and while this severance is marked, its causes and cures are not clear. The loving vignettes of chickens, goats and other Safe Haven residents, and of children helping animals and being moved to further altruistic endeavors as a result, are precious islands in this book as they are in the world. How can we expand these islands? How can children’s love for animals be nurtured into adult values and public policies? The Emotional Lives of Animals and Children takes us to Safe Haven Farm Sanctuary, bringing to life Katie the hen, Cleo the partridge, Burdock the rooster, Boomer and Mattie the goats and the relationships these animals share with one another and the human beings around them. The stories of their lives, their friendliness and fears, their eagerness and intelligence, are all the more poignant against the background of misery from which they emerge to tell us something about themselves through the voice of an adult whose own story of personal awakening holds promise. William Crain is a professor of psychology at The City College of New York. He is the author of the textbook Theories of Development, now in its 6th edition, and Reclaiming Childhood: Letting Children Be Children in Our Achievement-Oriented Society. A social activist, Crain works to broaden access to higher education and to defend animals. He and his wife, Ellen, are founders of Safe Haven Farm Sanctuary in Poughquag, NY, and the East Hampton Group for Wildlife. Visit Bill, Ellen and their animals online at Safe Haven Farm Sanctuary.